Xconverter 360 | SDTEKKEN.COM - TEKKEN News Resource! 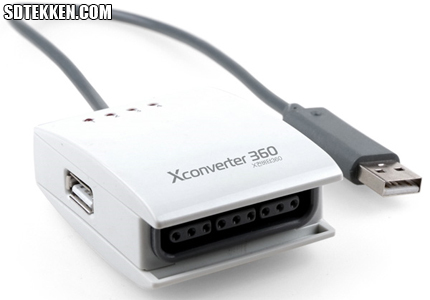 This product is a converter that allows PS2 controllers to be used on the Xbox 360 console. Compatible with PC (requires Microsoft PC driver), vibration is also supported. NOTE: You will need a wired Xbox 360 controller to register/sync PS2 controller to the Xbox 360 console. Is it compatible with PSX/One controllers? Yes it is. Tested with several PS1/PS2 arcade stick/controllers. wooden box stick receives bonus future applications. Is that switch on the side a PS3 USB? I also have the same question as Karma. I dont think you can use PS3 controllers with it. The USB port on the side is where you need to have a wired Xbox controller for it to work. Due to microsofts security stuff, you need a real controller to essentially “bypass” the security check. I’m pretty sure this is only for PS2 controllers to Xbox360. Have you done the lag and input drop tests on these? so… any review for this coming any time soon? Does this lag? I only have a 360 and wanted to get one of these to use when T6 comes out. I have the converter itself and I haven’t noticed any lag using the regular ps2 controller. If you check out the “converter compatibility thread” on shoryuken.com’s forums, they have a couple of guys who’ve already done lag and input drop tests. Does anyone know if it’s possible at all to go the other way round? I am considering getting a PS3 for Demon souls and Tekken 6 (so I can play both communities.) But the problem is I have a Streetfighter TE stick for 360 which I assume doesn’t work for the PS3. Is there any converter available which would allow me to use it? Unhappy for the large survey, but I’m rattling gaga the new Zune, and trust this, as considerably as the superior reviews several else individual backhand, faculty refrain you settle if it’s the faction option for you. that before. So great to discover another person with some unique thoughts on this topic. with your permission let me to take hold of your RSS feed to stay up to date with forthcoming post. not yet in humans) a common virus that played a role in high blood pressure. But tests with humans won’t be forthcoming right away. was due to concerns arising out of the lack of positive response with respect to either cholesterol or C-reactive protein levels, both key prospective markers of the study.